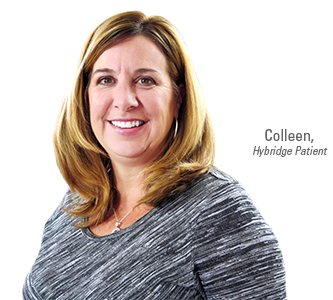 "I didn't want to wear dentures, so my dentist referred me to Hybridge. Once I found out they're permanent I knew it was the solution for me. Best of all, I don't have to cover my mouth anymore". 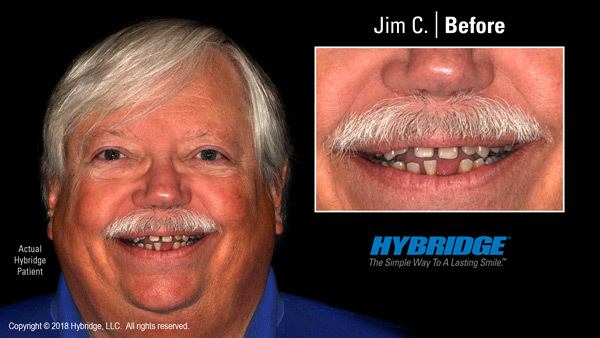 The Hybridge full arch dental implant bridge offers a simplified lasting solution for those in need of a full mouth reconstruction due to dental disease, congenital condition, or accident. Our certified doctors specialize in full-mouth dental implant restorations. Hybridge offers a unique process that seamlessly blends professional care with exceptional technology and artistry to restore comfort and full dental function. Hybridge's proven treatments transform our patient's appearance, confidence, and quality of life. Solve a wide range of dental problems – permanently, cost-effectively, and best of all, you'll never be without teeth. So if you're trapped in an endless cycle of root canals, crowns, or bridgework and are tired of treating the same teeth over and over again, solve your dental problems once and for all with a Hybridge Dental Implant Bridge. Hybridge Dental Implant restorations are created right here in the U.S.A. with precision technology and craftsmanship, ensuring an authentic solution that gives our patients the healthy mouth and beautiful teeth they’ve been longing for. The newfound comfort, renewed confidence, and ease of maintenance you'll enjoy with Hybridge Dental Implants will transform your quality of life for many years to come. 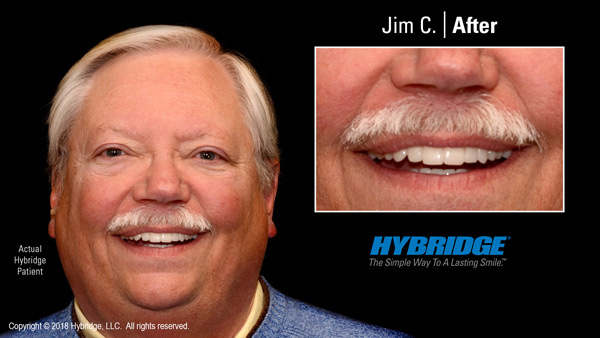 Visit the Hybridge Dental Implant smile gallery to view before and after photos of patient's who have had their life transformed by Hybridge. Each and every day Hybridge Dental Implant certified doctors make it their mission to not only bring back their patients smile, but to also fully restore their dental function. In doing so Hybridge Dental Implant patients experience life changing results.